Lucky Rich ... or how to play games with the .asia-community? June 2007: DotAsia announced Sunrise of .asia Domains. July 2007: DotAsia announced the agreement with Pool.com, a Canadian company, to be the Auction Partner for auctions arising from the .Asia Sunrise and Landrush processes. October 2007: Sunrise Period - Name Registration starts for Trademark Holders. If there is more than one Trademark Holder, there will be an auction between the applicants. April 2008: We informed dotasia: We received several non-committal mails from Edmon Chung, CEO of dotasia. The most remarkable sentence from Mr. Chung: "Being a party related to a bidding party, in my understanding, does not automatically create any issue." May 2008: We sent email to dotasia, that Throne Ventures Pty Ltd. is also involved in this complot. 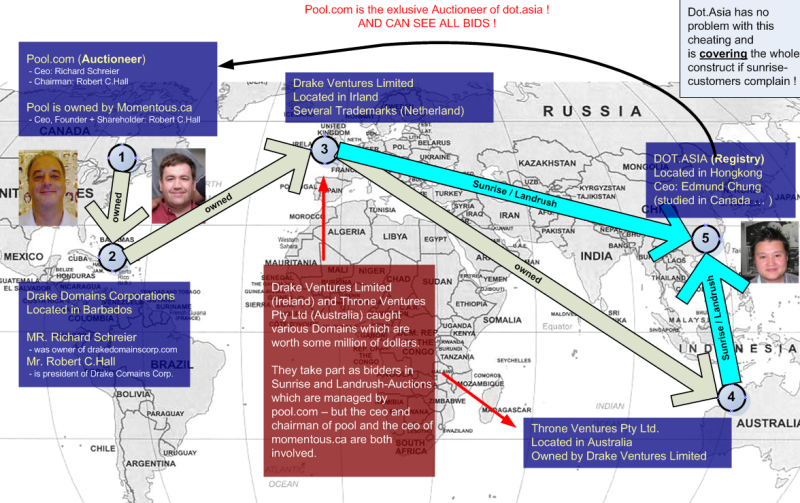 Throne is owned by Drake and both have won several auctions with a lot of topdomains until today . 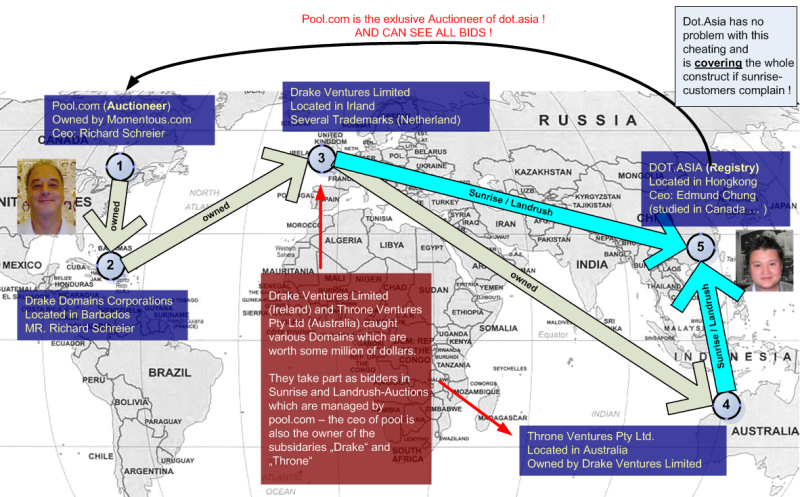 July 2008: Mr. Robert Hall, chairman of auctioneer pool is involved in this complot as the managing director of Drake Domains Corporation. This is the ultimate evidence about the close relationsship between auctioneer pool and some camouflaged bidding parties. Bidding parties probably owned by the CEO of the auctioneer seems to be no problem for dotasia? Grabbing a lot of top-domains by these bidding parties seems to be no problem for dotasia? The probable cause that the auctioneer and its CEO knows and exploits the maximum bids of all competitors seems to be no problem for dotasia?